Xcalibur W enables to power on devices by sending a magic packet over UDP Port 7. Right-click a listed device to display the Device Contextual Menu. The Wake On Lan option will send a Wake On Lan Magic Packet over the Lan and specifically for this device instructing it to wake up. To be fully functionnal, the Magic Packet shall be successfully transported over the network from the server down to the device. When publishing a task, user can elect to Wake On Lan devices. If the Wake-On-Lan option is enabled and at least one unit in the pool of target devices is powered on, that unit will send a Wake-On-Lan network event to other units in the pool. 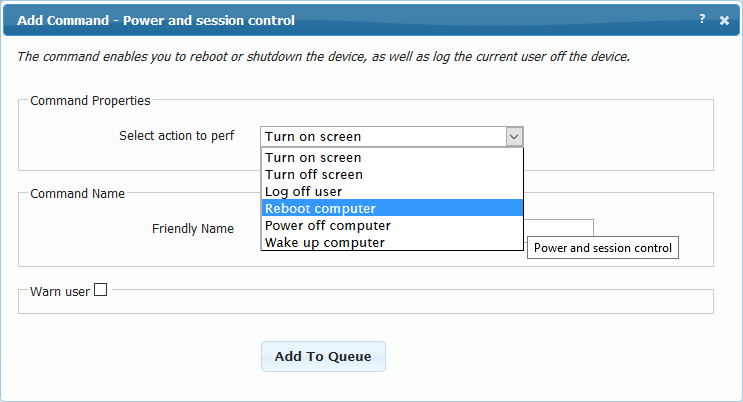 The Power and Session Control command allows administrators to perform a number of low-level user session commands, including Wake Up Computer. This requires that at least one unit in the pool of target devices is powered on, so that this unit will send a Wake-On-Lan network event to other units in the pool.